Leaving FeedBurner can be done in a few simple steps. Before you start, we recommend backing up any important data, statistics and email subscribers (if configured) from your Feedburner account. If you would like our support staff to walk you through the steps below for your podcast, please contact us regarding our podcast consultation services for a free quote. The next step is to remove your feed from FeedBurner. Before that, you will check to make sure that it is set to redirect to your new Podcast Mirror feed. 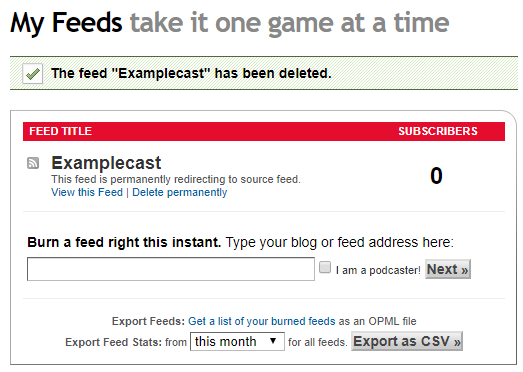 Log into FeedBurner and select the feed you want to move to Podcast Mirror. Click on Edit Feed Details near the top of the page. Change the Original Feed text box to your Podcast Mirror feed. Be sure to click the Save Feed Details button. Now you can delete the feed. Click on Delete Feed link, next to Edit Feed Details. Be sure to check the box that says With permanent redirection. Then, hit Delete Feed. If you see something like this, you’ve successfully deleted your feed. Any readers, podcatchers, directories, and devices will now follow this redirect if they are set to follow the FeedBurner URL. If you or anyone else tries to use the URL your FeedBurner feed was at, they will be redirected to your new Podcast Mirror feed. Congratulations, your feed is now set up with Podcast Mirror!